This textured hat is as fun to make as it is to wear. It’s a great opportunity to use a variegated or hand-dyed yarn, but it also looks great in a solid colour. The herringbone stitch is smooshy and stretchy making it very warm and snug. 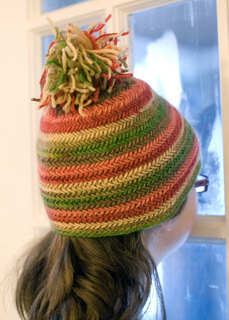 This enchanting hat is knit fairly loosely on large needles for excellent stitch definition. Add a large pom pom for a bit of extra fun. 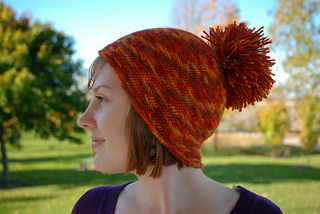 This hat is knit from the bottom to the crown with a worsted weight yarn. This hat has three sizes and a visible seam. A huge thanks to LIVEFORTHENEEDLE for sample knitting the Urth Uneek Worsted!